We lose 20% of our clients every year! - I'm your PA : The virtual assistant company that likes to make you smile. We lose 20% of our clients every year! Most businesses would not share such a statistic, but for us this is one we are really proud of! The thing is, every year we lose 20% of our clients as we have helped them grow to the point that they need to take on a full time employee – we consider this a real success, so how do we do it?!…. When clients first start with us they tend to just want us to take a few calls, but then they learn more and more of what we can do, diary management, setting up and managing of CRM systems, preparing and following up on quotes, helping with invoicing and the chasing up of outstanding debts – the list goes on. 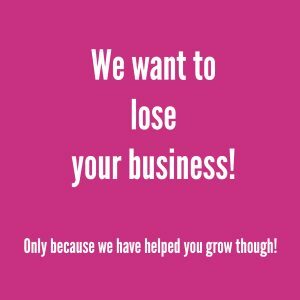 As clients take on more of our support their business tends to increase until ultimately we know they are in a position to take on a full time member of staff, it is sad to lose them, but it is great to see them grow. We have had a number of these clients who have come back to us for holiday cover and also as business increases again to the point where they cannot cope with just one member of staff, so we step back in as they build ready to take on a second member of staff. We have a very varied base of clients both in business and in size of business. Many people think that a virtual P.A. is just for “one man bands”, you may be surprised to know that one of our biggest clients has a turnover well over a million a year, they are a national company and they still use our services most days. So as we kick off 2018 we have a couple of clients on a real growth plan this year, our goal is to support them and get them to the point where they too will be employing their own full time staff by the end of the year. The CRM systems are set, the processes are all in place, so let the fun begin! I guess I should also point out we do have clients who have been with us 10 years too!